All the distinction between oil olives and table olives means is that olives bred for oil will usually have a higher oil content and table olives will usually be larger and have a better pit to flesh ratio. You can pickle oil olives and you can press table olives. If, after reading this post, you discover you have an oil variety, pickle away. You will just have small olives rich in oil on your table. 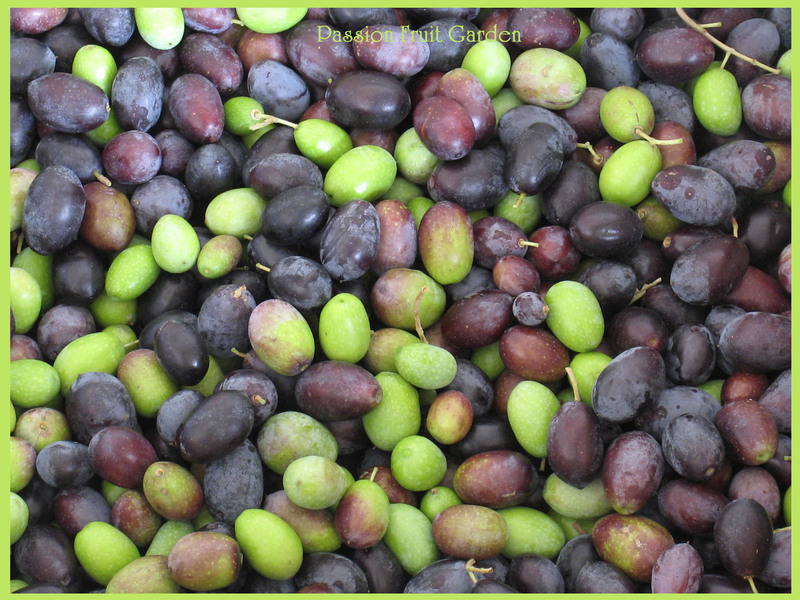 All olives start out grassy green, turn a light apple green (see the Verdale photo below) and then purple. 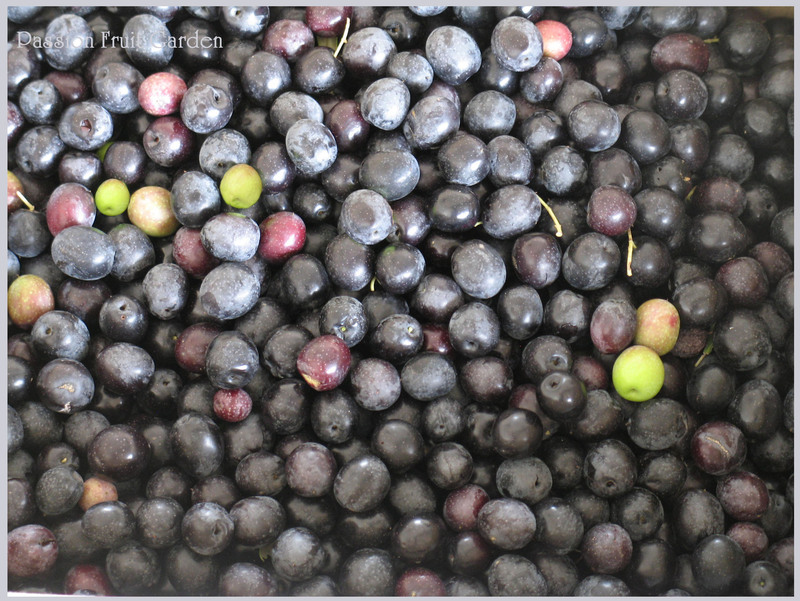 I have been advised that if picking for oil, the best combo is 50-50, ie, about half apple green and half purple. This is to get a balance between taste and oil quantity. If you have an early variety and a late variety, you will sometimes get this balance by default . If picking for the table, pick when the colour is best for the style you are pickling. Kalamatas are usually pickled fully ripe, others green but, mostly, it depends on your taste. This year we have picked later than we usually do as we were away but because we got so many Verdales, which obviously ripen later, we have a good mix. 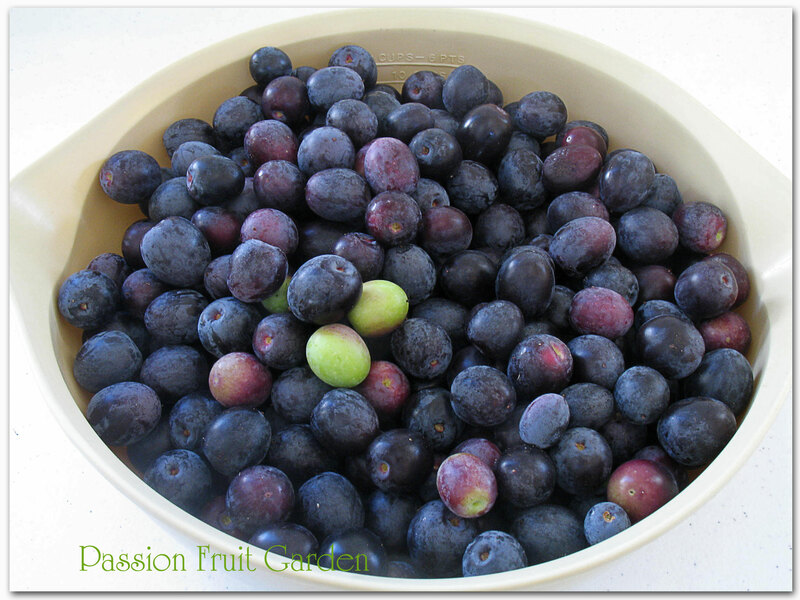 Don’t wait until all the olives are purple if picking for pickling as I have found the olives will end up mushy. The prime source of the information below is from The Olive Book by Gareth Renowden. Verdale originated in France. 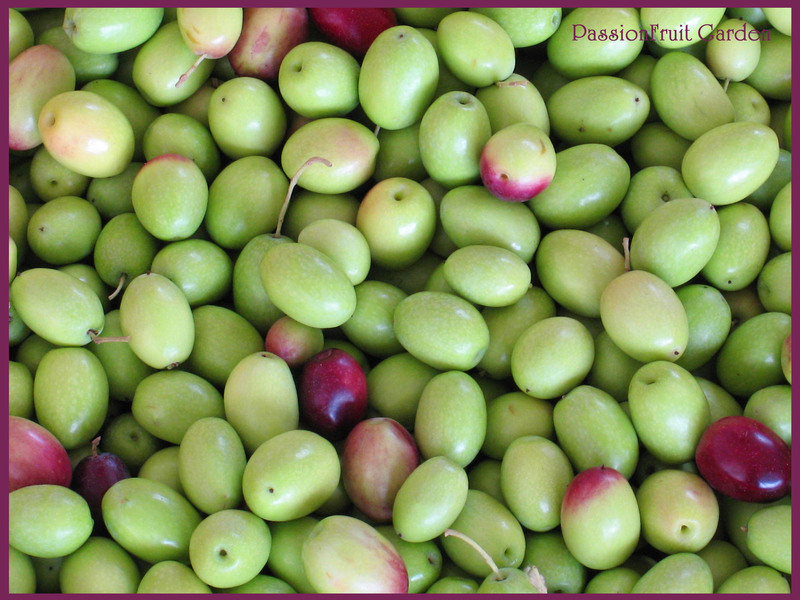 It is classified as an oil variety but is grown for both its oil and for table olives. The tree tends to be quite small and is clearly a late variety as mine are only just beginning to turn purple. Kalamata is a Greek olive most famous for its excellent pickling qualities but, as with all olives, it can be used for oil as well as pickling. It is usually harvested when fully ripe. It is reportedly hard to propagate, which would explain why the tree is generally more expensive to buy than other varieties. Manzanillo originates from Spain. It is a pickling olive. It also produces good oil but has low yields. It is a relatively small tree. Clearly, it is an early variety as mine are all dark. I pickled this olive green last year and they look wonderful. If pickling these olives, I would pick them a bit earlier than this. 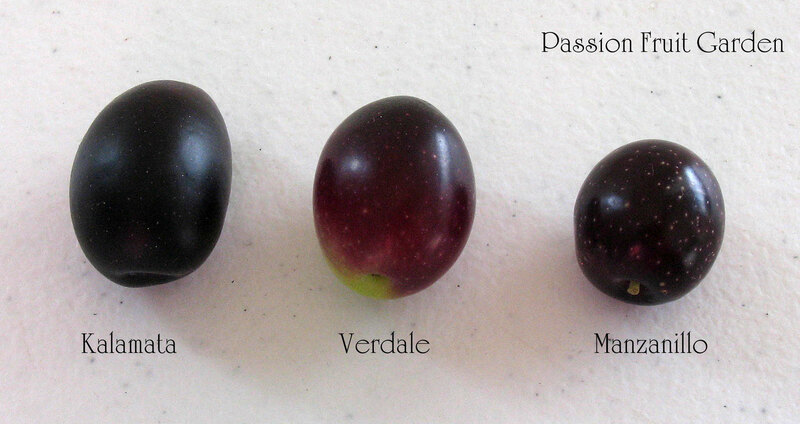 Here is a comparative photo of Kalamata, Verdale and Manzanillo. The Kalamata’s distinctive almond shape is not very evident in the photo. Mission (WA) comes from the trees planted by the monks at the New Norcia monastery to make their award winning oil. It is classified as an Australian variety but must have Spanish origins (as do the monks). It is different from Mission (California) but it appears to have a similar origin as that variety arrived in California with Spanish missionaries. The tree tends to grow very tall. The birds love these olives. For years, this one tree would produce enough olive oil to last Maus and me for the year but, alas, now birds usually strip it. Arbequina originates from a small town near Sevilla in Spain. The trees are adaptable to different conditions of climate and soil. Arbequina thrives in long, hot, dry summers, but is also frost-hardy. Arbequina has an early growing cycle, it can produce as early as its third year. 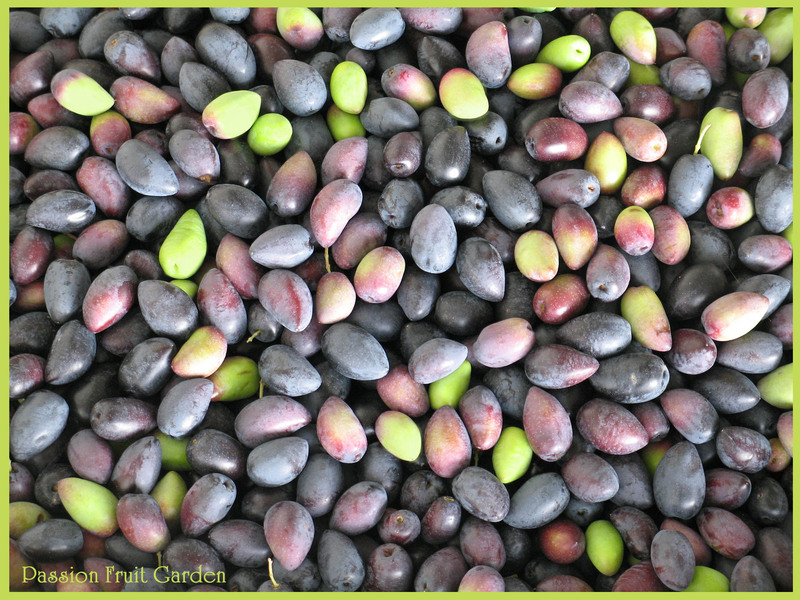 The olive is favoured for its high yield productivity and constant annual crop averages. 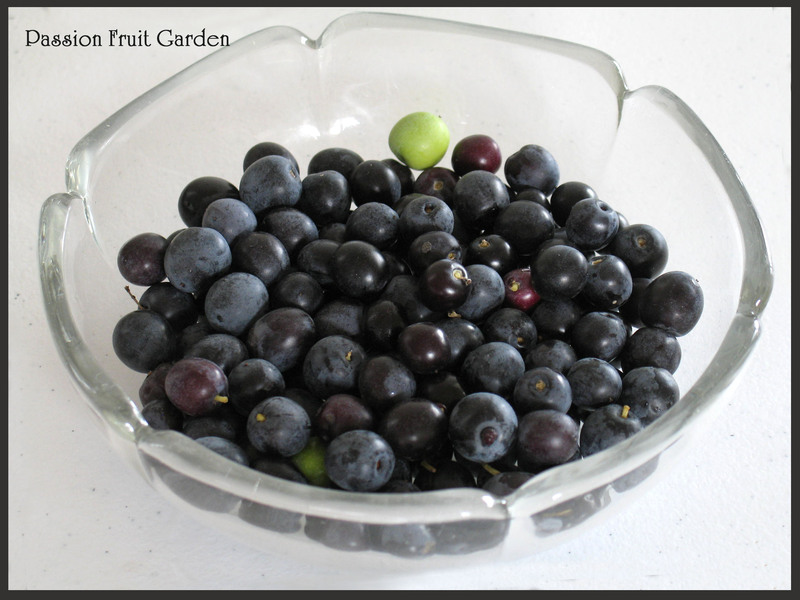 Arbequina produces cute, small round fruit, which look a lot like grapes. The fruit ripens early. Frantoio comes from Tuscany, Italy, where it is renowned for its flavour and quality of oil. It has small to medium sized fruit with high oil content and is well known for its nutty flavour. The tree bears good crops of smallish olives. UC13A6 (Californian Queen) – The UC stands for University of California which developed this olive. It has very large table fruit (~11.5g). It has good flesh to pit ratio, reportedly has excellent texture and flavour and is usually pickled green. If you like your olives big, this one is for you. Here is a comparative photo showing how big the UC 13A6 is compared to Frantoio and Arbquina. It is huge. Sevillano – as the name suggests, it is of Spanish origin. This is the first olive tree I got (it was a gift from Maus’ mum) and it has never produced one olive. It clearly is a seedling. At the time, it was difficult to get olive trees in Perth and, probably, some old Italian guy decided to pot up his seedlings and sell them. The only reason it survives is the fact that it was a gift. Each year it flowers and has masses of tiny olives that don’t develop. The lesson here is: don’t plant seedlings. Servillano is supposed to be a pickling olive with good flesh to pit ratio. The fruit reportedly bruise easily (I wouldn’t know) and has, primarily, been replaced with Manzanilla. We take our olives to Jumanga Olives (Old Yanchep Rd Carabooda) to be pressed. This year, they are pressing up to 50 kilos for $20.00. They are also selling olives on a pick-your-own basis for $1.00 a kilo. This is especially good if you don’t have many and would like to top up. If you are interested, ring Juta on 9561 2411. They are a lovely family. So what type of olives do you have? If you have another variety, I would love a photo of them. 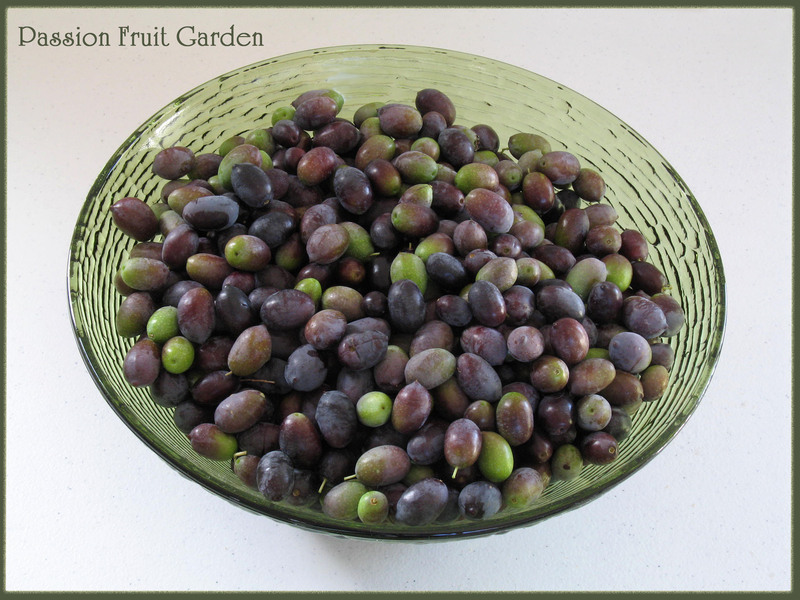 This entry was posted in In My Garden, Olives, Preserving the bounty and tagged Frantoio Olives, Kalamata Olives, Koroneiki Olives, Manzanillo Olives, Mission Olives, Olive varieties, Verdale Olives by Glenda. Bookmark the permalink. Excellent info,easy to follow,thanx! Mine died off,after transplanting from Merriwa to Mt Nasura. Suckers developed, I chose one and nurtured it, wallah! She’s got 3 pieces of fruit on one branch. I noticed after being away for a week. I simply never noticed any blossom, whilst nurturing. It’s been 3, probably 4 yrs in developement, I’m extatic, it seems to be the sucker grew as a seedling does?! All that remains now is, identifying the variety, and of course, Hope, there’s a full crop next year, oolalah! She’s now 1.8 m high, and with a bita good pruning and TLC from me the 72 yr old Pomme novice, ha ha! from North Yorkshire, 37 yrs ago, will have enough fruit on his plate of Gorganzolla and Jatz, to enjoy with his Esspresso! Thanx for everything! HAPPY NEW YEAR! Fab news Trev, one morning I came out and noticed rabbits had ring barked 20 of my young trees. I cut the trunks off and let a sucker come up and they all grew. Well done to you too. Hi Glenda! Its good to hear your news too, because it seems that others amongst us simply don’t try these ways, and just go out and buy more trees. I’m up for experimenting, means and ways, its interesting to me! Glenda, I’ve been looking at the different varieties and I may have found the one I have. Two I’m looking at are, Manzanillo and Castelvetrano ??? At this time now, they are Round, Dark Glossy Green! Hows that sound to you Glen, any suggestions?? Thanx again!! Hi Trev. I think it is more likely to be Manzanillo. I know the Castelvetrano olives. They are yummy but I don’t think the tree is available in Australia. I can’t see them advertised anywhere and I just saw an article that said they are not available in Aust. The fruit is very similar to Manzanillo. A couple of years ago, we bought a Verdale tree partly on the information on your website. However, it produces both normal size and very small fruit, too small to be useful for anything. About 50% of the fruit is small. I had hoped they would eventually enlarge but it is not looking like they will. I have searched for information about this but could not find anything. Does your Verdale also produce small fruit? If so, do you remove them for the benefit of the normal size fruit? Thanks Glenda. It is not a grafted tree – the same branch can have large (25 mmm long) and tiny (4mm) fruit. This is true over the entire tree. I got it from a nursery clearly labelled as Verdana. The first year it fruited, I thought maybe it was a response to stress of just having been planted; it didn’t fruit last year, and this year it is back to the large and small fruit. It sure sounds like it, Grant. There is a guy called Thomas Ganz from Jumanga Olives in Carabooda who did his doctorate in olives, he may be able to help you. I think Stan Kailis was his professor. He also may be able to help. Let me know how you go. Hi Glenda, Ive just emailed you some pictures of our olive tree – could you please help me identify it? The fruit is huge – Im wondering if its the UC variety you mentioned above. It sure looks like it Alison. We planted 4 Kalamatta trees 5 years ago and both last year and this one tree has given us fruit another very little & 2 none at all, any explanation? All have grown very well and are very healthy. Hi Ed, If you got them from the same place at the same time then I have no explanation. If you bought them at different times then my guess is they were propagated differently. Maybe the two that have not produced fruit were seedlings or propagated by buds whereas the one that is producing was grafted. Who knows? Sorry I can’t really help you. Don’t give up on them though. We moved into a new place last year and noticed two trees which look suspiciously like olive trees that are fruiting like mad, but we’re not sure if they actually are olives. Are you able to suggest where we can take cuttings to have them identified (Perth Metro), or would you be able to identify it from a photo if we send one to you? If they’re actually olives I’m keen to try curing some. But we heard there’s a plant that looks like olives but is actually poisonous, so I’m not game to experiment without some confirmation. Hi Michele. If they are fruiting at the moment they are sure to be olives. If you send me a photo with a couple of fruit and a couple of leaves I could confirm for you. Also, if you measure one of the fruit I may be able to tell you what variety it is. My email address is pfgarden@optusnet.com.au. Sorry I can’t help you. I just checked out the Waroona wholesale nursery where we got our Koronieki from. They do not have it. Hi Tandy, no probs, do you have similar varieties in SA?